The photo id for this photograph is 29, in the Trains and Railway Lines album. 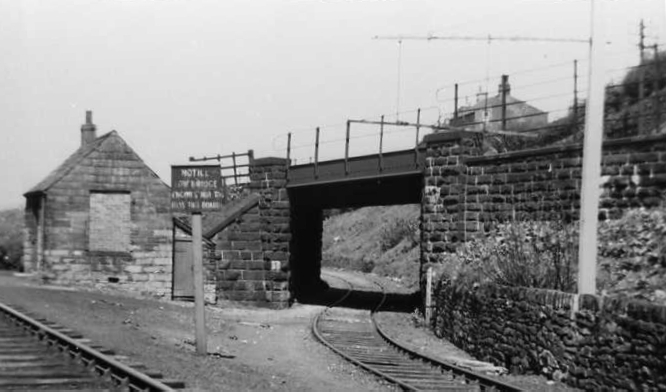 Bridge 43, where the main line up to Buxton passed over the C&HP route to the Canal Basin. The photo, from 1949, is looking towards Whaley station, and the line on the far left is the spur from the main line onto the C&HP towards Shallcross. The line to the right is the branch to the canal basin, via what is now Stanways yard. The loading gauge is because there is insufficient clearance under bridge 43, and this section was always worked by horses.